HMS Trafalgar was the lead boat of seven T class SSN's for the Royal Navy, powered by a Rolls Royce pressurized water reactor with back up diesel-electric power these submarines weigh in at 5200 tonnes submerged and have a top speed in excess of 30 Kts. HMS Trafalgar was the only one out of seven that didn't have pump jet propulsion instead it had a regular propeller. They all have anechoic tiles to help absorb active sonar and top flight sonar systems; they're now armed with the very good Spearfish torpedo which replaced the very bad Tiger fish. These boats have been controversial in recent years with groundings during exercises, accusations of dragging fishing vessels under and fires that caused injuries to the crew. 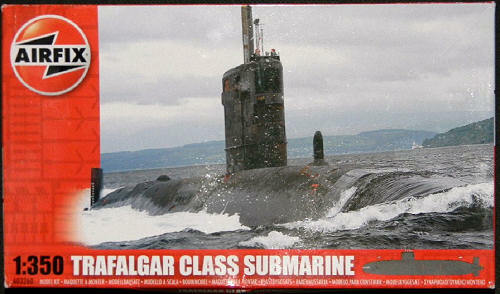 They are soon to be replaced by the Astute class. 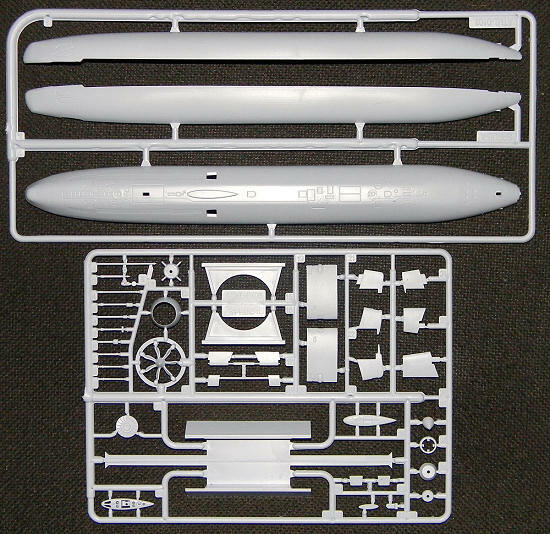 I'm very happy to say that Airfix, thanks to Hornby; are back. Who'd would've thought that we'd get two modern RN vessels in injected plastic within the same year and in 350th scale too. Who'd have also thought that it'd be molded in India! There are 41 pieces on two sprues, a decal sheet that looks pretty sharp to my old eyes. The instructions consist of 15 steps with color call outs in Humbrol numbers. You can build any one of the seven in the class as both prop and propulsor is included also the decals for the names that attach to it's sail are also included; apparently the RN would rather it's boats have their names on them instead of pennant numbers. You can also build it with or without periscopes or dive planes. The parts seem to be well molded in light grey plastic with little flash. The details are recessed but a little soft but not terminally so but the gates holding the parts look like they'll need a little care to remove as they are large and thick. Unusually the hull is a three part affair so I suppose you could do a waterline from it with a little care. This, like other sub kits should be just the ticket for a relaxing build after the many hundred parts super kit you've just spent several months on, if you want to represent anechoic tiling you're going to have to do it yourself as it's not represented in the kit but what do you want from a kit that costs as little as this. The kit was speedily delivered from White Ensign Models courtesy of my wallet. I also got the WEM photo etch for it and can't wait to get started.